Reflecting the rapid progress in the field, the book presents the current understanding of molecular mechanisms of post-transcriptional gene regulation thereby focusing on RNA processing mechanisms in eucaryotic cells. 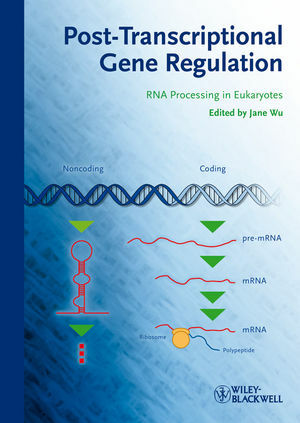 With chapters on mechanisms as RNA splicing, RNA interference, MicroRNAs, RNA editing and others, the book also discusses the critical role of RNA processing for the pathogenesis of a wide range of human diseases. The interdisciplinary importance of the topic makes the title a useful resource for a wide reader group in science, clinics as well as pharmaceutical industry. Jane Y. Wu is the Charles Louis Mix Professor in the Department of Neurology, the Lurie Cancer Center and the Center for Genetic Medicine at Northwestern University in Chicago, USA as well as a senior consulting investigator at the Chinese Academy of Science, Beijing, China. After obtaining her doctorate from Stanford University and her postdoctoral training at Harvard University, Dr. Wu has been focusing on studying molecular mechanisms controlling gene regulation, in particular, those critical for neural development and neurodegeneration. Her research has significantly advanced our understanding of the fundamental role of RNA processing in biology and in human pathogenesis.